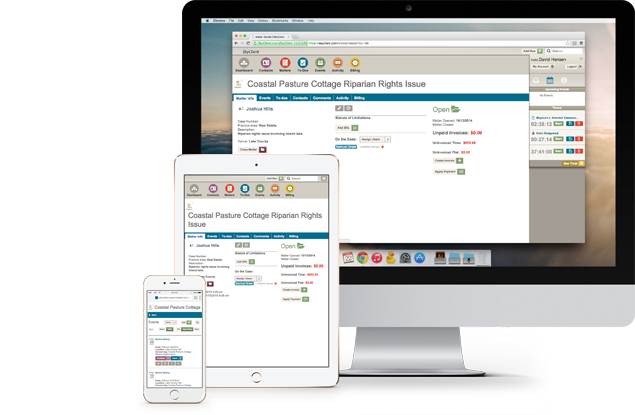 EASIER, FASTER PRACTICE MANAGEMENT SOFTWARE FOR ATTORNEYS. Combine your legal expertise with SkyClient’s intuitive law firm practice management tools. Save time doing what really matters to create your practice, made perfect. SKYCLIENT® GETS YOUR FIRM UP AND RUNNING QUICKLY AND EASILY. CLIENT MANAGEMENT, MATTER MANAGEMENT, TIME TRACKING, BILLING, INVOICING, AND MORE, ALL IN AN EASY TO USE, STREAMLINED PACKAGE. IT’S TIME TO START SAVING TIME. LAW FIRM PRACTICE MANAGEMENT THAT IS FAST, EASY, AND FLEXIBLE. Access all of your clients’ info quickly and easily, and stay in touch with one click calls, emails, and maps. Link contacts to see who is related to whom and how. Schedule events and assign to-dos to keep you on task and your schedule humming along smoothly. Have all of the who, what, when, and where at your fingertips wherever you are and whenever you need it. Conveniently track time and expenses, and effortlessly add them to invoices. Rapidly create invoices from multiple templates and save, print, or email. Efficiently accept payments for invoices or apply them to your clients’ trust accounts with only a couple clicks. SkyClient makes it fast and simple to get started. Easily import clients or add them and their matters with only a few clicks. Getting organized has never been easier.